Lone acorn is a special symbol which denotes good luck. When starting my own blogs, I could think of nothing else which could inspire me. Doomed by boredom I started blogging both to kill time and to do something worthwhile which bears my own identity. October is leaving making me feel guilty about how much less time I have given to my love my blog and my fellow food enthusiasts. At first it was festival fervor and then all the festivities had left me tired. But Diwali festivities were indeed a joy. A time which comes once in a year. Visiting friends and having guests have made me gorge on so much of calories. I am sure each of the food lover must have put on a few kilos. Post the festivities, the time to shed those extra kilos has come. Being not an exercise person what max I can do is with food. That too cutting on the high calorie ingredients and opting for healthier ones. And now with cold winds and dropping temperatures winter is on its way. A time when we want to sleep a bit more in mornings, eat a bit more in meals and feel a bit more drowsy. Light soups are a delight in this cold weather. Warming our souls and protecting us from the cold winds. And when it comes to soups, I have a special liking for Chinese soups. Hot n spicy balancing the coldness. Last night I decided on making Wonton soup keeping my dinner light and having a great morning ahead. Deriving its name from Cantonese (simplified Chinese), the name won ton means swallowing a cloud. 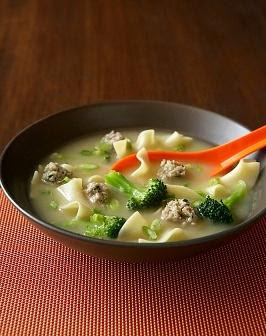 The wontons floating in this popular soup of Chinese cuisine are thought to resemble clouds. The soup is served hot and makes a fulfilling meal in itself. * Mix all the wonton ingredients together properly to make the filling. * Then moisten the edges of the wonton wrapper with water. * Place a big teaspoon of the filling in the center and fold the edges giving desired shape. * Take care in closing the edges so that the won tons do not open while boiling. * In a large pan boil water add the won tons made. * Let them cook for 10 minutes and they come up in the pot. * Remove them from the pan and set aside. * Boil chicken broth in another pan with salt and pepper according to your taste. * Add broccoli, scallions and won tons to it. * Bring it to a boil. Note: No need to add all the won tons made. You can use a few as per your requirement and freeze the rest. For almost 2 months you can use them for making wonton soup. Your soup looks so warm and inviting and nurturing! Am inviting myself to ur place just to finish this gorgeous soup! Amazing soup - yours looks delicious! lovely and a perfect healthy soup and yummy also.you can also visit my blog and give ur comments. Hi Anshika....tht's a gorgeous soup and an awesome click!!! Delicious soup and lovely pic..liked the brocolli tikki too...very nice one..thanks for sharing ..
A yummy and perfect soup for this cold weather!!! Gorgeous click, perfect and healthy soup for winter! Nice pictures. What type of camera do you use?